Once you found the mailbox you were looking for, click corresponding Delete icon in the right. Now you see the page with some options. 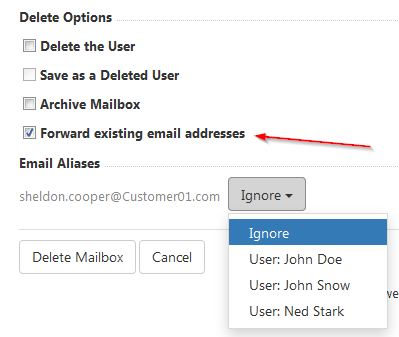 Normally when you delete a mailbox, a corresponding user will remain in the system. So if you want to delete user as well, check Delete the User. You can also Archive this mailbox. 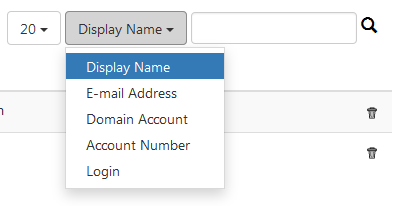 Next, if you want the inbox messages to be forwarded to another user, check Forward existing email addresses and select address where you want to forward all correspondence. 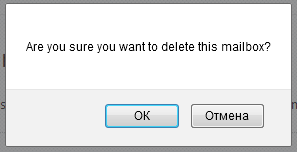 Once you're done here, click Delete Mailbox and then click OK when prompted. Done! Now this mailbox has been deleted.